Two times two is 4. The chain is directly attached to the captive coupling of the shortening element. This has the advantage, that there is no additional connecting element needed, because the hook functions both as a connecting and a shortening element. The assembly and disassembly is done easily, quickly and without special tool by a competent person. 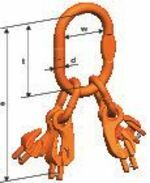 Once mounted, this IV-leg master set with four welded-in XKW shortening hooks for the assembly of IV-leg chain slings in the assembled system will not be budged! The set is manufactured according to EN 818‑4 with the mechanical values of G10 and come with a CE-marking for certified quality. Example: VMXKW 4-10 may be used for IV-leg chain slings with a 10 mm chain.